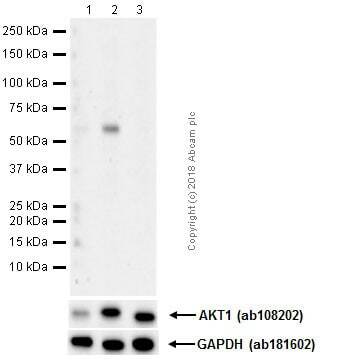 Rabbit recombinant monoclonal AKT1 (phospho S473) antibody [EP2109Y]. Validated in WB, IHC, Dot, ICC/IF, In-Cell ELISA and tested in Mouse, Rat, Human. Cited in 198 publication(s). 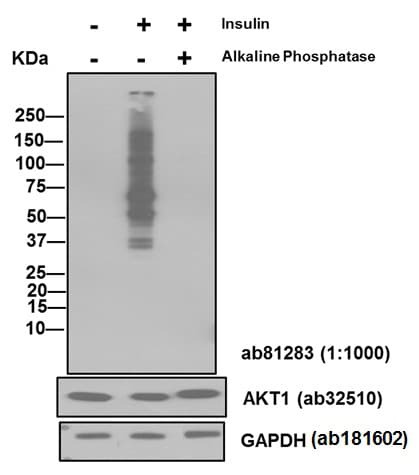 ab81283 detects AKT1 phosphorylated at Serine 473. The region of AKT1 surrounding S473 has a high degree of similarity to the corresponding regions in AKT2 and AKT3 and thus may cross react with these proteins if phosphorylated on the corresponding serine residue. A phospho specific peptide corresponding to residues surrounding Ser473 of human AKT1. WB: HeLa (grown in serum free media overnight, then treated with 150nM Insulin for 5min) whole cell lysate; MCF7 (treated with CCCP) whole cell lysate; LNCaP (treated with 100nM Cacyculin A for 30min) whole cell lysate; NIH/3T3 (treated with PDGF) whole cell lysate. IHC-P: Human cervical carcinoma tissue. ICC/IF: NIH/3T3 (treated with PDGF) cells; PC-12 (treated with galanin) cells; PC3 and MCF7 cells. IHC-Fr: Human peritoneal tumor tissue. Our Abpromise guarantee covers the use of ab81283 in the following tested applications. WB 1/5000 - 1/10000. Predicted molecular weight: 56 kDa.Can be blocked with AKT1 peptide (ab171724) or AKT1 peptide (ab217601). MCF7 cells were incubated at 37°C for 2 hours with vehicle control (0 μM) and different concentrations of CCCP (ab 141229). Increased expression of AKT1 (phospho S473) (ab81283) in MCF7 cells correlates with an increase in CCCP concentration, as described in literature. Whole cell lysates were prepared with RIPA buffer (containing protease inhibitors and sodium orthovanadate), 10μg of each were loaded on the gel and the WB was run under reducing conditions. After transfer the membrane was blocked for an hour using 5% BSA before being incubated withab81283at 2 μg/ml andab8227at 1 μg/ml overnight at 4°C. 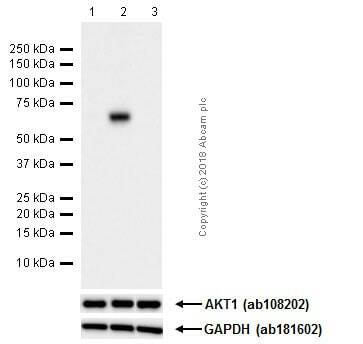 Antibody binding was detected using an anti-rabbit antibody conjugated to HRP (ab97051) at 1/10000 and visualised using ECL development solution. Dot blot analysis of AKT1 (phospho S473) phospho peptide (Lane 1) and AKT1 non-phospho peptide (Lane 2) labelling AKT1 (phospho S473) phospho peptide with ab81283 at a dilution of 1:1000 dilution (0.259μg/ml). 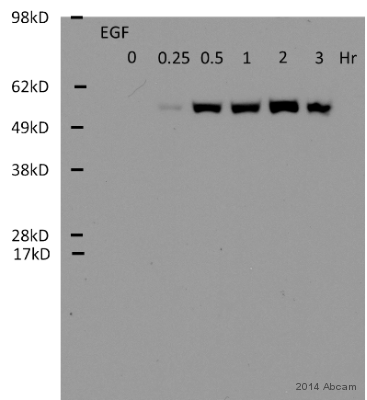 A Goat Anti-Rabbit IgG, (H+L), Peroxidase conjugated (ab97051) was used as the secondary antibody at a dilution of 1:20,000 dilution. Blocking buffer: 5% NFDM/TBST. Dilution buffer: 5% NFDM /TBST. Immunohistochemical analysis of Human HPV16 immortalized keratinocytes transfected with non-targeting siRNA, staining AKT1 (phospho S473) (green) with ab81283. Antigen retrieval was performed by heat mediation in citrate buffer (pH 6). Samples were blocked with 10% goat serum before incubating with primary antibody (1/100). Fluoroscein-conjugated tyramide was used to detect staining. Insulin treatment: cells were starved overnight and then treated for 20 min (Insulin) at 100 ng/ml. Phosphatase treatment: membrane strips were incubated with 200 ul of phosphatase (150 U/ml) at 37 degrees for 1 hour. 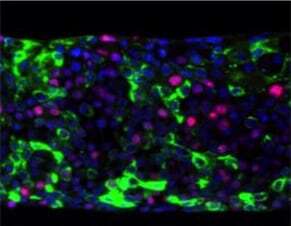 PDGF treatment: cells were starved overnight and then treated for 1 h with PDGF at 100 ng/ml. NIH3T3 cells were starved overnight and treated with PDGF 50ng/mL or vehicle control for 1 hour prior to fixation with 4% paraformaldehyde. 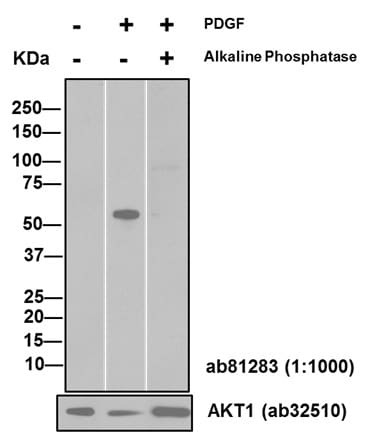 Levels of total Akt were measured using antibody ab81283 on an infrared in cell ELISA assay platform. PC12 cells were incubated at 37°C for 24 hours with vehicle control (0 nM) and 1 μM of Galanin (1-15) (porcine, rat) (ab 141152). Decreased expression of AKT1 (phospho S473) (ab81283) in PC12 cells correlates with an increase in Galanin (1-15) (porcine, rat) concentration, as described in literature. 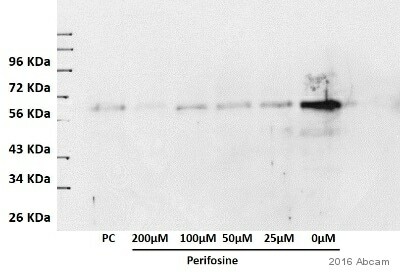 Whole cell lysates were prepared with RIPA buffer (containing protease inhibitors and sodium orthovanadate), 30μg of each were loaded on the gel and the WB was run under reducing conditions. After transfer the membrane was blocked for an hour using 3% milk before being incubated withab81283at 1 μg/ml andab8227at 1 μg/ml overnight at 4°C. 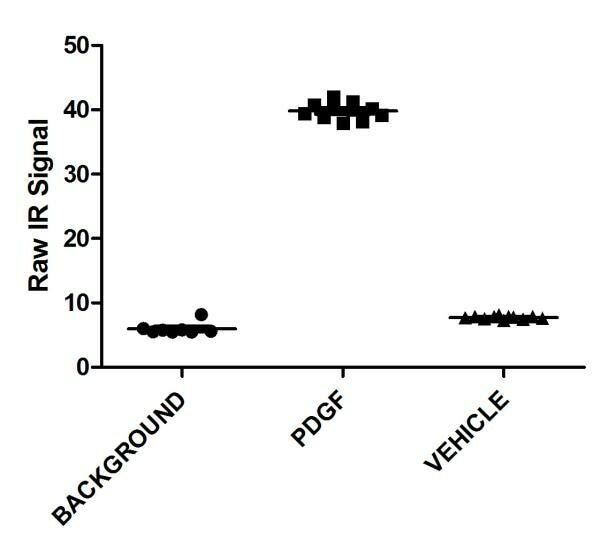 Antibody binding was detected using an anti-rabbit antibody conjugated to HRP (ab97051) at 1/10000 and visualised using ECL development solution. ab81283 staining AKT1 (phospho S473) in Human peritoneal tumor tissue sections by Immunohistochemistry (IHC-Fr - frozen sections). Tissue was fixed with paraformaldehyde and blocked with 1% BSA for 1 hour at room temperature. Samples were incubated with primary antibody (1/500) for 2 hours. 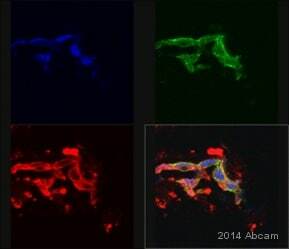 An Alexa Fluor® 647-conjugated Donkey anti-rabbit IgG polyclonal (1/1000) was used as the secondary antibody. Publishing research using ab81283? Please let us know so that we can cite the reference in this datasheet. 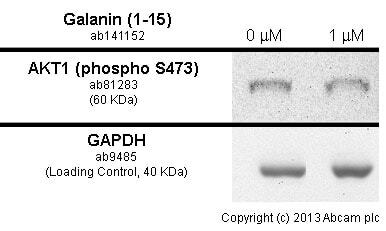 I am a Ph.D student studying at the University of Malta and I have some queries regarding my recent order:Anti-S6K antibody [E175] (ab32359) and Anti-AKT1 (phospho S473) antibody [EP2109Y] (ab81283). 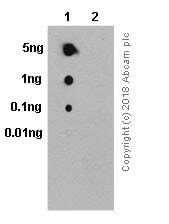 To which S6K isoform (S6K1 and/or S6K2) does Anti-S6K antibody [E175] (ab32359) react to? 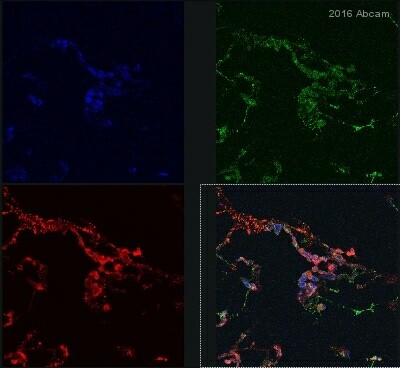 Moreover should the Anti-AKT1 (phospho S473) antibody [EP2109Y] (ab81283) stain normal tissue as I have been having the same intensities in tumour and in normal tissue. I have tried the Akt1 on cervix, breast and prostate tumours with surrounding normal tissue and in all cases it was difficult to determine between normal and tumour by the intensity. The exact epitope is proprietary, but the immunogen sequence is approximately 20 amino acids long and maps within amino acids 400-440 of p70 S6 Kinase of human origin.Thismeans, that both isoforms will be detected as they differ on the N-terminus.